Highlands Digital Media is one of the leading providers of Digital-Out-Of-Home marketing solutions in the southeast. We currently manage more than 500 digital signs that are deployed across retail digital signage solutions & private networks, medical offices/facilities, digital menu boards, as well as our ad supported network, HDMTV. One of the largest location-based networks in the southeast with 84 screens reaching about 500,000 in monthly consumer traffic while driving more than 2,000,000 impressions. Our displays are strategically located in public venues that are made up of urgent care centers, medical facilities/offices, health clubs, retail stores and quick serve/casual dining locations. 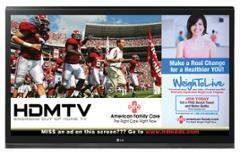 HDMTV features engaging content that includes sports, news, local weather, and health & lifestyle segments. The average dwell time for consumer in front of most HDMTV network screens is between 45 and 60 minutes. In a HDMTV venue, advertisers can not only communicate with a potential customer, but potentially influence them 6 – 7 times per visit. Highlands Digital Media is a member of the Digital Signage Federation.